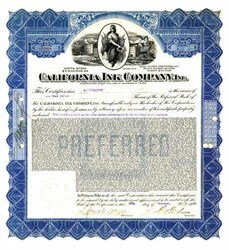 Beautifully engraved certificate from the California Ink Company (Cal/Ink) issued in 1920. This historic document has an ornate border around it with a vignette of a Lady Liberty in front of a manufacturing plant. This item has the signatures of the Company's President, George D. Graham and Secretary, Robert G. Arlett and is over 98 years old. 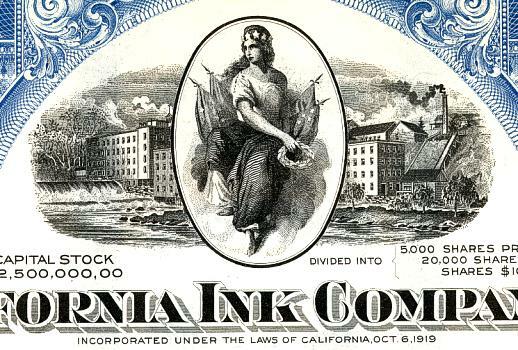 The California Ink Company originated as a business in 1891, in Los Angeles, as a subsidiary of Union Oil Company. The company's factory was located in West Berkeley, California with branches in in Portland, Seattle, San Francisco and los Angeles. The Company was incorporated as a California corporation on Oct. 8, 1919 to acquire all the assets the California Aniline & Chemical. Co. and the printing Ink Business of Geo. D. Graham which was established in 1890 in San Franciso. The company manufactured and sold news, printing and lithographing inks, dry colors, printers' rollers and varnishes. It also owned real estate and plant in Berkeley and Los Angeles, Cal., also has distributing branches in San Francisco, Los Angeles, Seattle, Portland and Salt Lake City. On Oct. 1, 1928, it acquired the business of Geo. Russell Reed Co., Inc.
Over the years, Cal Ink made almost every type of ink product, from a white ink for marking bees to perfumed ink used in advertising. The products developed and manufactured included: moisture-proof and heat-resistant inks, inks that resist scratching and oxidation, inks used for newspapers, magazines, boxes, bags, labels, and linoleum, plastic, steel, aluminum, airplane parts, and fabric. It is one of the largest suppliers of ink to the graphic arts industry. From time to time it produced many of the raw materials for ink, such as pigment colors and varnishes. An international company, it uses materials from all over the world including: drying oils from South America, shellac from India, pigments from Europe, and carbon and mineral oil from the United States. It then exported its various inks around the world. During World War I, Cal Ink developed and produced the first �Litho Red� ink made in the United States. In the 1940's, Cal/Ink was first U.S. company to make and market lithol red pigments. In 1950, Cal/Ink developed the nation's first magnetic inks for check imprinting. Today the company is a division of the Flint Ink Company of Detroit. In 1929 the Officers were �Geo. D. Graham, Pres. ; Paul W. Shattuck, C. M. Reed, Vice-Pres. ; A. N. Nathan, Sec. & Treas. Directors�Max M. Cohn, Chmn. of Board, Gustav Epstein, W. H. French, C;co. D. Graham, William H. Lowe, A. N. Nathan, C. M. Reed, R. H. Shainwald, Paul W. Shattuck. General office-426 Battery St., San Francisco.